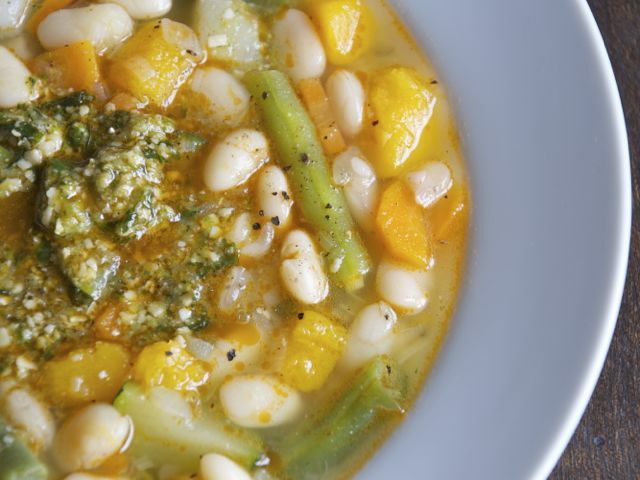 The French have imposed their own pronunciation on the Italian minestrone to describe a hearty soup of boiled vegetables and pasta. The Provençal pistou is a pomade of garlic, fresh basil, grated cheese, and olive oil, descendant of the Genovese pesto. A soupe au pistou is a minestrone into which, at the moment of serving, a pistou is incorporated. Beyond that point of definition, no two are alike. Add leeks, onion, carrots, potatoes, squash, white beans, and the bouquet garni to salted, boiling water and cook, covered, at a light boil for about ½ hour. Test the beans for doneness and, if necessary, cook a bit longer, or until they may be crushed with little resistance while remaining still completely intact. Add the green beans, zucchini, and macaroni, and cook another 15 minutes until the pasta and green beans are done but not mushy. While the soup is cooking, prepare the pistou: Pound the garlic, basil, salt, and pepper to a paste in a good-sized mortar, using a wooden pestle and alternating between pounding and turning with a grinding motion. Work in some cheese until you have a very stiff paste, then add about one third of the tomato, pounding and grinding to a paste, more cheese, a bit of olive oil, more tomato, and so forth, the final addition of cheese bringing the consistency to that of a barely fluid paste. Add the remainder of the olive oil slowly and progressively, turning the while. It will not produce a genuine emulsion and should not. Serve the soup boiling hot, with the mortar of pistou at the table. Each diner stires a small ladleful (1 or 2 tablespoons) into his soup. A quart-sized marble aïoli mortar is perfect for making the pistou. Use a wooden bowl if nothing else is available.